Although not published until 1969, ‘In This House of Brede’ is set in the 1950s and was adapted for television in 1975. 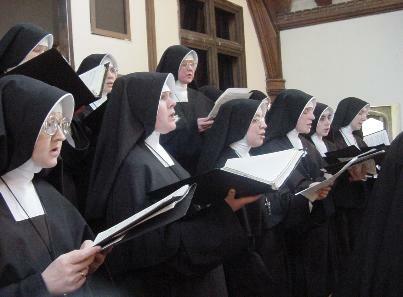 As is explained at the very beginning of the book, it arose out of the author’s close contact with the Benedictine community at Stanbrook Abbey during a family crisis. Involving intensive research into the Benedictine history, liturgy, music and traditions, it took her five years to write. During this time, the abbess at Stanbrook asked, rhetorically, in her presence, why nobody ever wrote novels about nuns and she couldn’t bring herself to say that she was in the middle of doing just that. The novel concerns – mainly – widow Philippa Talbot who, in middle age, gives up her successful civil service career to join the House of Brede. Before entering the abbey as a postulant, she orders three whiskies at the local pub, and drinks them in the space of half an hour, only to find, when she eventually gets there, that she is required to kiss all her new sisters in religion. She mentions to the abbess that she might smell of alcohol but there is no question that she can hold it. Philippa is a character a reader can have confidence in – able, level-headed, not afraid of making hard, (but wise) choices- although it is apparent that some of the other nuns find her a threat. The reader also shares the lives of other members of the community: the anguish of Sister Cecily, whose family and friends cannot understand her vocation, and put every obstacle in her way; the insecurities of Dame Catherine, who, to her surprise, is elected abbess, and, in time, becomes a more effective spiritual leader than sainted Mother Hester who preceded her. ‘In This House of Brede’ was the second book recommended to me by my beloved aunt in Canada (the other being Alan Bennett’s ‘The Uncommon Reader’ – see earlier review), a remarkable choice for someone who is not a Christian. My aunt is also my Godmother, but she tells me that she didn’t dare say no when my mother asked her. There is a wonderful photo of her holding me, draped in oceans of shawls, at my Christening, with – apparently – my grandmother (out of the picture) telling her how to hold a baby. She has been a very caring Godmother to me, especially after my own mother died. Even though I read Rumer Godden’s ‘The Greengage Summer’ many years ago and found it irritating, I enjoyed ‘In This House of Brede’ more than I have enjoyed any book for several months. I always seem to get on better with the older books. Over the last few days, I have pondered why and I cannot exactly put my finger on it, except that it appears to me that novels written in previous generations tend to generate characters, like Philippa Talbot, whom the reader can have confidence in, whereas contemporary writers are always encouraged to create characters who are flawed, and not just a little bit flawed either. I get very frustrated with characters who get blind drunk and then do something totally stupid. Older works also tend to be written upbeat, whereas nowadays dystopia is very much the fashion. I have enough to be depressed about in real life without taking on the troubles of a character in a book, who – after all – doesn’t actually exist. But I seem to be in a minority of one here. This entry was posted in Godden, Rumer and tagged In This House of Brede, Rumer Godden on 14/09/2015 by Rosemary Reader and Writer.